Energy medicine offers the potential for understanding real mysteries of nature, for developing valuable health practices and for learning how to create healthy environments in which to live. -- Lewis Thomas, M.D., former President of Sloan-Kettering Institute, and author of Lives of a Cell (from which this quote is taken). The study of energy medicine is the study of the "many working parts lacking visible connections." The forces and fields that connect organ to organ, body to mind, and mind to nature are not always visible. This invisibility does not mean that they do not exist. It may only mean that we have not even looked for it or have not yet developed the technology to objectively see, feel, or measure these interconnective forces. The traditional definition according to physics refers to energy as "the capacity to do work" or as "a measurement of activity." This meaning of energy is appropriate in conceptualizing energy medicine as long as the definition of "work" or "activity" not only includes the gross changes in biochemical and physiological systems but also includes the changes in energy levels and field phenomena that affect human health. Modern understanding from chaos and complexity theories confirms that even subtle changes in energy levels and field phenomena have the capacity to catalyze significant biological transformations. At the same time that energy medicine practitioners have begun to explore the fields and forces within the organism that have self-organizing and self-healing capacities, practitioners of modern medicine have begun to recognize self-regulating processes within the organism that work to defend and heal the individual. Both groups are perhaps uncovering the same field phenomena. Whatever one calls this self-healing/self-regulating capacity, this inherent defensive and survival strategy helps the organism act with wisdom in adapting to all stresses and to heal and transform itself as it acquires greater complexity and biological strength. Ultimately, the concepts of energy medicine are futuristic, even though many of the most popular modern-day energy medicine practices are hundreds or even thousands of years old. Thinking of the health and life of living organism in the light of energetics and field phenomena represents an important shift of perspective, and a predictable evolutionary step in the development of science and medicine. This invisible yet ubiquitous self-healing/self-regulating system or field within the organism has been given various names at different times in history and in different cultures. Hippocrates called it "physis" (from which the word "physician" was derived); Paracelsus called it "archeus"; the modern-day scientist and discoverer of vitamin C, Albert Szent-Gyorgyi, called it "syntropy" (which he defines as "the drive in matter to perfect itself"); the Chinese have referred to it as "ch'i"; the yogis as "prana"; homeopathic physicians -- "vital force"; and naturopathic physicians -- "vis medicatrix naturae" (translated as "the healing power of nature"). It is easy to remember that before microscopes were developed, many people had difficulty believing in the existence of bacteria. It is not surprising that many people today have difficulty accepting the possibility of an energy system within the body since, like the invisible microbes before Leeuvenhoek's times, we haven't yet developed the technology to see it. As science develops more and more sophisticated technologies that help us observe the action of smaller and smaller processes (cells, then intracellular parts, then molecules, and then atoms), it seems obvious that understanding energy processes and fields will be a natural evolution for scientific endeavors. It is not an easy task to assess energy flow within the human body. Many of the health practices that are based on this type of assessment have taken hundreds or thousands of years to develop into coherent workable systems. Acupuncture, for example, has developed over the past 2 - 3000 years, and its international popularity and stature is significant and undeniable. In order to evaluate the status of human energies, the acupuncturist uses pulse diagnosis with other diagnostic tools. The quantity and quality of this energy flow informs the practitioner about the degree of pathological penetration and suggests the susceptibility of the person to certain conditions prior to their actual manifestation. The five-element theory in Chinese medical practice along with other important principles of healing can guide the acupuncturist to finding the significant acupuncture points on the body that will balance the ch'i, thereby increasing or restoring its quantity and/or quality and augmenting the healing process. Understanding how meteorologists predict the weather may actually be a useful metaphor for a better understanding of the practical workings of the energy flowing through the body. Meteorologists predict the weather by measuring wind patterns and high and low air pressure. By doing do, they predict where clouds will go and if and where it will rain. Wind and air pressure are forces, or energies, and if experts ignore these invisible forces and only watch and evaluate those elements of nature that can be seen (clouds), their skills at predicting weather will be embarrassingly poor. By understanding and observing how energy flows, experts can then predict how matter will be influenced and how it will behave. Likewise, acupuncturists can predict disease processes when too much or too little energy pervades specific meridians. Acupuncturists use their needles to help move the ch'i from areas where there is much to areas that are under-nourished, creating more balance and health. Understanding and working with bodily energies is not just some "woo-woo" concept but has practical diagnostic and therapeutic value. In a parallel fashion, homeopathic medicine has spread to virtually every country in the world, and it is often considered a Western energy medicine. Like his/her Chinese counterpart, the homeopath utilizes a detailed body-mind symptom analysis to assess a person's constitutional state of health. The person's health is evaluated by assessing obvious and subtle symptoms, with greater emphasis placed on those unique symptoms that differentiate one person's disease from another. Homeopaths commonly inquire about a person's sensitivity to hot or cold temperature, influences of time of day or night on health, motion or position of the body, food desires or aversions, sleeping habits, sweating patterns, emotional or mental states and how each of these phenomena influence individual symptoms and a person's overall state of health. In so doing, homeopaths treat each person and his/her disease and his/her unique syndrome of the disease. Just as physics and music verify that there is hypersensitivity from "resonance" (a "C" note will be hypersensitive and will vibrate when a "C" note from another instrument is played), homeopaths observe that sick people become extremely hypersensitive to medicines that cause in overdose a similar syndrome of symptoms that they are experiencing. Over 200 years of experience by hundreds of thousands of physicians and billions of patients have experienced the power of homeopathic medicines, and, surprisingly, have observed that the more often a homeopathic medicine undergoes the pharmacological process of serial dilution, with vigorous shaking of the solution between each dilution, the medicine becomes stronger with fewer doses needed and actually lasting longer. Present laws of physics and chemistry (called "Avogadro's number") assert that in all probability one should have no molecules remaining after 24 dilutions of 1:10. And yet, many homeopaths prescribe medicines that have undergone 30, 200, 1,000, 10,000, 100,000 or more dilutions (with vigorous shaking in-between each dilution). At first blush, one might assume that there is "nothing there," and yet, there is not only a body of evidence from the basic sciences and from clinical trials, there is also a body of evidence to suggest that there is something unique that happens when double-distilled water is vigorous shaken in glass vials. Luc Montagnier, the French virologist who won the Nobel Prize in medicine/physiology in 2008 for his discovery of the Human Immunodeficiency Virus (HIV), has recently published research that has given significant support for homeopathy and homeopathic pharmacology. (2) Montagnier utilized electromagnetic signals made from bacterial DNA that were serially diluted in water that was "highly agitated" after each dilution in water (this process of dilution with agitation is the same as the manufacture of homeopathic medicines). Montagnier even noted that the effect from these extremely small doses was entirely negated if the medicine was subjected to heat or freezing, a similar observation found in homeopathic medicines. Ultimately, for over 200 years homeopaths internationally have confirmed that sick people have a hypersensitivity to a specific medicinal substance that, if given to healthy people in toxic doses, will cause the similar symptoms that the sick person is experiencing. Like acupuncture and other energy systems of medicines, the heightened power and effect of those homeopathic medicines that have undergone greater potentizations (the process of serial dilution with vigorous shaking in-between dilutions) may be the result of what the homeopaths call the "vital force" becoming sensitive to and resonant with the medicinal agent. Because symptoms of illness are adaptive and defensive responses of the body to fight infection and/or adapt to stress, homeopathic medicines are matched and selected for their ability to mimic and augment this effort to elicit a healing response, thus leading some people to refer to homeopathy as "medical aikido" and "medical biomimicry." Therapeutic touching practices seem as old as records of history. Certain sensitive therapeutic touch practitioners, like many psychics, seem to see energy patterns (or auras) around and through people from which susceptibility to disease can be diagnosed. The gaps in energy patterns, the degrees of density and the colors emitted from the body together provide diagnostic information. Band-aiding gaps in energy patterns, 'tonifying' the energy's overall density and balancing the field that emanates from them are therapeutic methods used to manipulate forces and fields that stimulate a healing process. Initially, these beliefs and claims appear metaphysical. But research in biological science and environmental medicine is beginning to explain the influence of field effects, bio-electrical processes and biological hypersensitivity upon human health. The use of electrical current to stimulate wound healing and bone regeneration is stirring the medical community with its successes and implications. Researchers find small doses of electrical current that mimic the electrical potential from the wound or bone can stimulate its healing. Others find that imposing an electrical field to a recently amputated limb, say in a frog, can lead to appreciable regeneration where slower regeneration would normally occur. The significance of this research is that it begins to show the special curative value of changing electrical fields within an organism to influence biochemical and physiological function. Specialists in environmental medicine have looked at how low-dose energy from fluorescent lights, air ions, microwaves, cell phones, sound and electromagnetic fields can distort cell functioning and result in illness. Although most people may not experience any obvious effects from these fields, it can and should be acknowledged that there seem to be some hypersensitive individuals for whom such influences have significant impact. It has long been known that such stressors can cause chronic conditions after long-term exposure; however, recent research shows that significant functional abnormalities occur from low doses well before structural changes take place. The neuro-endocrine system, with its hypersensitivity to various low dose phenomena, may be a primary mediator for the various energy emanations; however, the occasional rapid manifestations of symptoms from exceedingly small doses may indicate some other yet undefined communications pathway in living organisms. It is important to acknowledge the capacity of an organism to respond to external energy, and it is time to recognize the possibility of an internal energy system within the body that might be resonant or dissonant with these environmental influences. Back in 1989, I read a fascinating book called The Compass in Your Nose and Other Astonishing Facts About Humans (by science writer Marc McCutcheon). The author provided evidence of trace amounts of magnetized iron in the human nose and suggested that its magnetic properties enable our sense of direction. Other researchers have found that birds have magnetite in their beaks which may help them with their amazing navigational abilities to migrate long distances. (3) Still other researchers have found concentrations of magnetic particles in the human brain (4)(5) and in other parts of the human body. (6) Research has just begun in evaluating the role of magnetite in health and in disease. (7) (People who wish to follow-up on this area of inquiry will benefit from doing a google scholar of "magnetite" and "biomagnetite"). When one realizes that many parts of our body are infused with magnetic particles, one must also wonder how these invisible but active forces and fields influence the body and its health. One might also wonder if treatments that mimic or resonate with these fields might be optimized in our health care system. The implications for having magnetic fields in the body could be significant, and this area of inquiry is inadequately explored by mainstream medicine. Sadly, our sophisticated medical system has focused on biochemical process, while ignoring the fields and forces that influence biochemistry. Our modern medical instrumentation simply reinforces the biochemical processes. It is not that we should ignore biochemistry (obviously), but our modern era beckons us to consider an integrative model of health and medicine so that the diversity diagnostic and therapeutic processes can lead to the safest and highest quality health care. Until and unless our medical sciences assesses and accounts for the field phenomena of the human organism, doctors will be blinded to knowing about interconnective forces in our bodies...and until this happens, doctors will be like meteorologists who try to predict weather by only looking at clouds. The newly published book, Green Medicine: Challenging the Assumptions of Conventional Health Care, by Dr. Larry Malerba, considers the vitalistic viewpoint of health and healing to be so essential to the green medicine perspective that its first chapter is entitled "The Unifying Life Force." The fact of the matter is that American medical care embodies a mechanistic and reductionistic view of health and disease. Its treatments may effectively rid a person of a specific symptom, but it may be time to realize that simplistic and mechanistic thinking provide primarily only the guise of health improvement. It is therefore no wonder that American health care is ranked at 37th in the world, while virtually all of the countries that have the greatest use of energy medicines are ranked at the top. Further refinement and synthesis of the empirical basis for energy medicine is needed, and research on its diagnostic and therapeutic processes is essential, though I'm sure that some people whose income or paradigm of medicine or science is threatened will do their best to squash such investigation or integration. Understanding the forces that tie and bind our body and mind, and those that connect us with nature will not be easy. Such forces and fields of life cannot be placed under a microscope, but they can be understood and studied. Energy medicine offers the potential for understanding some very real mysteries of nature, for developing some valuable health practices and for learning how to create healthy environments in which to live. This field of inquiry is on the cutting edge and needs the sharpest of minds to fathom its realities -- and its limitations. Ultimately, the energy medicine paradigm proves a useful model to understand and explain healing. "Scientific revolutions ... seem revolutionary only to those whose paradigms are affected by them. To outsiders they may ... seem like normal parts of the developmental process." Energy medicine is a logical evolutionary step for medicine. I invite you to step out with us to help understand more fully its meaning, its depth, and its significance. And finally, Albert Szent-Gyorgyi, the Nobel Prize-winning scientist who discovered vitamin C, once asserted, "In every culture and in every medical tradition before ours, healing was accomplished by moving energy." 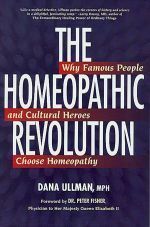 (12) It may be time for mainstream Western medicine to catch up with the past and to enter the future of real healing. Dana Ullman, MPH, begin thinking seriously about energy medicine in 1981 when he organized a conference at U.C. Berkeley entitled "Conceptualizing Energy Medicine." Over 400 people attended a conference with Fritjof Capra, PhD, Peter Eckman, MD, PhD, Peter Levine, PhD, Bill Gray, MD, Richard Grossinger, PhD, Elizabeth Rauscher, PhD, Len Duhl, MD, David Sobel, MD. (2) Luc Montagnier, Jamal Aissa, Stéphane Ferris, Jean-Luc Montagnier, Claude Lavallee, Electromagnetic Signals Are Produced by Aqueous Nanostructures Derived from Bacterial DNA Sequences. Interdiscip Sci Comput Life Sci (2009) 1: 81-90. (4) Wiltschko W, Munro U, Ford H, & Wiltschko R. "Bird navigation: what type of information does the magnetite-based receiver provide?". Proc. R. Soc. B 2006;273 (1603): 2815-20. (7) Grassi-Schultheiss PP, Heller F, and Dobson J. Analysis of magnetic material in the human heart, spleen and liver. Biometals. December 1997;10. (9) Cole KC. First You Build a Cloud. New York: Harcourt Brace, 1999, 30. (10) Cole KC. First You Build a Cloud. New York: Harcourt Brace, 1999, 34. (11) Malerba L. Green Medicine: Challenging the Assumptions of Conventional Health Care. Berkeley: North Atlantic Books, 2010. (12) Donna Eden. Energy Medicine. New York: Jeremy Tarcher/Penguin, 2008, p. XIX. (13) Albert Szent-Gyorgyi, Introduction to a Submolecular Biology. New York: Academic Press, 1960. Homeopathy: A Modern Alchemy and Energy Medicine.